Culture and heritage lie at the very heart of French society, and nowhere more so than in the Pyrenees mountains in SW France. Here timeless traditions continue to be celebrated and are kept very much alive by dedicated groups of people who are determined that the ways of life of their forebears will not be forgotten. ‘La Transhumance’ is one such tradition. the ‘Bethmalais’… perform traditional dances and sing evocative and heartfelt songs in the local Occitan dialect, songs which have been handed down through the generations. Deeply ingrained in the mountain way of life, ‘la transhumance’ is the name given to a tradition which dates back to Medieval times and which involves the movement of livestock (cattle, sheep and horses) between their winter homes in the valleys and the high mountain pastures known as ‘estives’, where they spend the summer months. 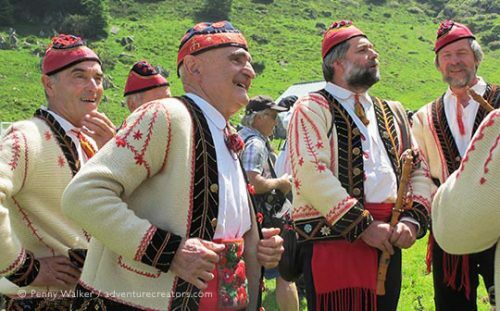 Every year in early June in the Couserans area of the Ariège Pyrénées village communities, which are not known for shunning an excuse for a good old knees-up, celebrate the transhumance by putting on one big party or ‘fête’ to which all and sundry are invited. What better way to showcase the culture which binds these communities together and to bring their traditional song and dance, not to mention food, to a wider audience! Today members of the public have a unique opportunity to experience this deep-rooted culture for themselves. 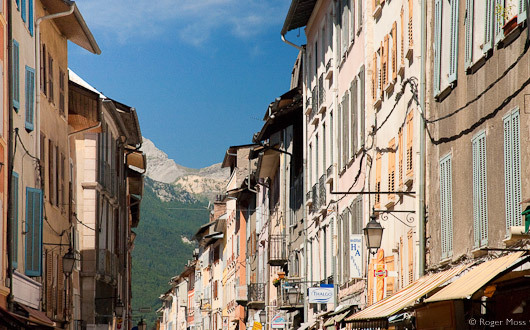 In the village of Seix for instance, you’ll witness parades of traditional singers, dancers and musicians and watch as the livestock breeders parade their animals through the village streets. But there’s more to it than this. Visitors have the chance to accompany the herds of sheep, cattle and horses from the valleys up to the estives. 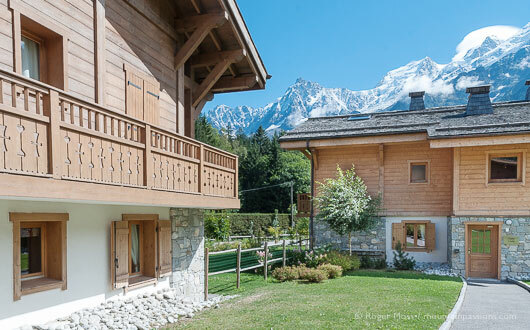 By prior arrangement, horse-lovers will even have the opportunity to ride one of the locally-bred ‘Mérens’ horses up to the high pastures, and really be part of an experience which has been going on in this area for centuries. After a full day in the saddle or on your feet, you’ll be rewarded with a meal of traditional fayre which is served on arrival up at the estives. Local lamb will have been butchered and then braised slowly with locally-grown vegetables, to be served accompanied by chunks of freshly-baked bread. 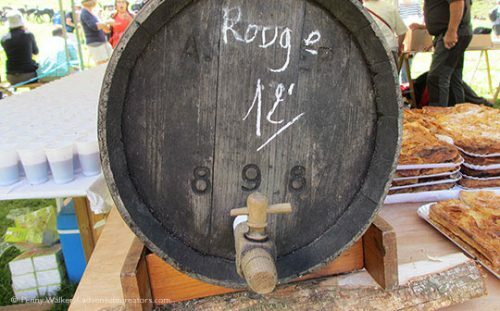 To wash down the meal copious quantities of red wine produced in the Ariège is naturally de rigueur. The apple ‘croustade’ which follows is another local speciality of melt-in-the-mouth flaky pastry filled with purée of apples or locally-harvested bilberries. 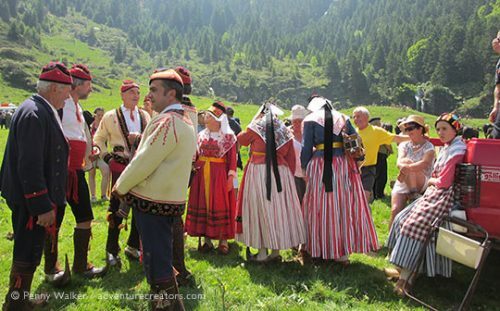 In the Bethmale valley area of the Couserans, traditional song and dance go hand in hand with the transhumance. A group of local individuals known as the ‘Bethmalais’ provide the entertainment for the occasion. They perform traditional dances and sing evocative and heartfelt songs in the local Occitan dialect, songs which have been handed down through the generations and which they are committed to keeping alive. The singers are accompanied by traditional musical instruments such as the ‘hautbois’, a curious reed instrument resembling the clarinet and made from box wood, with elements fashioned from bone or antlers. 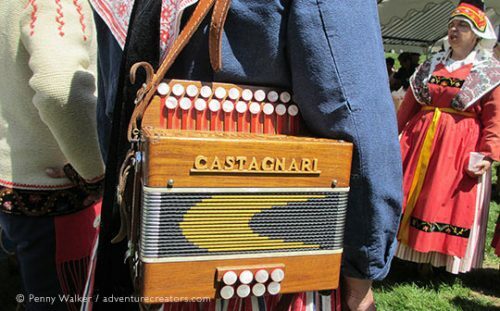 The diatonic button accordion is the other instrument which is integral to the music. But it’s the traditional costumes worn by the singers and dancers which catch the eye. The most striking features are the ornate clogs which are produced by one of the last traditional clog-makers in the area. His workshops are open to the public and visits can be arranged. All of the bright, colourful clothing is handmade from materials available in the valley, just as they have always been. Wool from the local sheep is carded and spun before being dyed with natural dyes from plants and vegetables. The only item not made locally is the ribbon, which has always been brought in by foreign traders. The summer transhumance is one of the most important events on the cultural calendar of the Ariège Pyrénées and provides the opportunity to experience first hand the culture and traditions which are at the very heart of the mountain communities here. Come and join us in early June to see for yourself. Specialists in unforgettable adventure holidays, The Adventure Creators are based in the beautiful and unspoilt mountains of the Pyrenees. 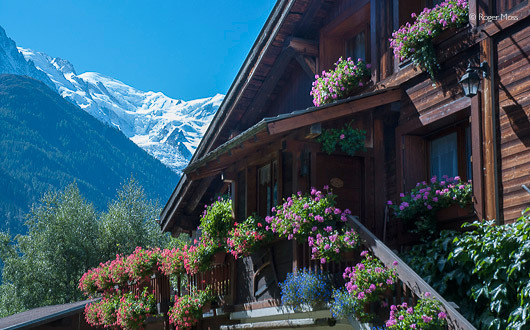 They offer numerous sports specific holidays like ski touring, snowshoeing and mountaineering in winter and horse riding, mountain biking and walking in the summer. 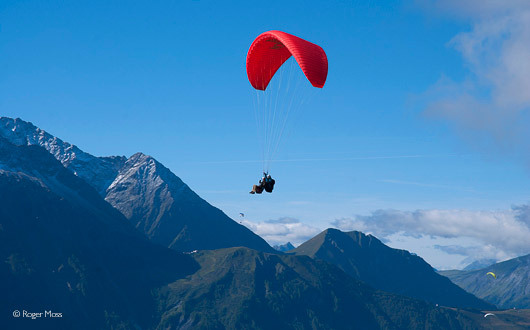 If you don't find the adventure holiday that you are looking for on the website they will tailor make it for you. The transhumance takes place over the first and second weekend of June every year. 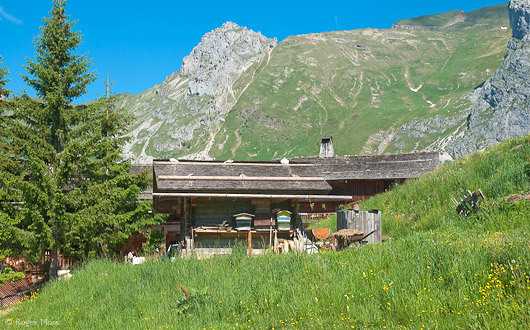 The first weekend in June is the transhumance in the Bethmale area and then the second weekend of June in the Haut Salat.